What do a wandering outlaw, a blaster-toting raccoon, a humanoid tree, a green-skinned female assassin, and a vengeance-seeking superhuman warrior have in common? Not much. Except that the fate of the galaxy rests in their hands and paws and branches. 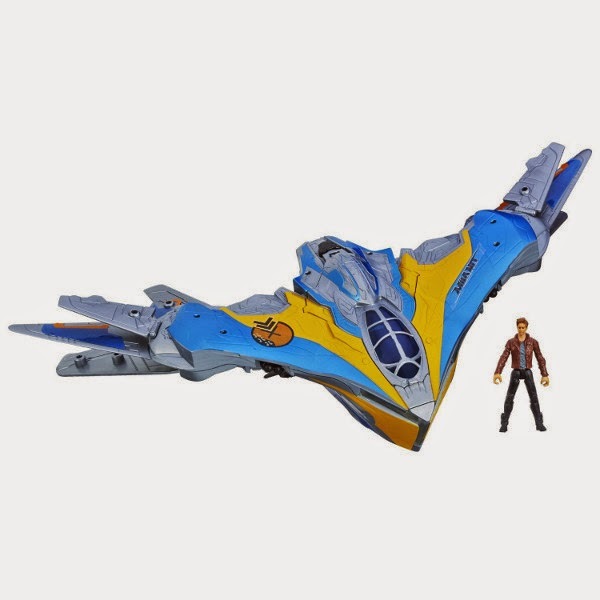 When Peter Quill (he calls himself "Star-Lord") steals a mysterious orb, he becomes the center of a galaxy-wide manhunt. Joined by a group of like-minded (for now) misfits, Rocket Raccoon, Groot, Gamora, and Drax, Star-Lord sets out to save the universe! Oh, and they call themselves... The Guardians of the Galaxy! Sparking a galaxy-wide manhunt for yourself and the mysterious orb you stole can put you in some "interesting" situations. And you might find you need more than charming wit and good looks to escape your foes. Star-Lord knows this all too well, which is why the Milano Starship is equipped with 2 firing missiles! Handsome gaze not winning over the enemy? Fire a missile! Charming wit suppressed from the fate of the universe being placed on your shoulders? Fire a missile! Star-Lord has 2 favorite sounds: 80s music and explosions. 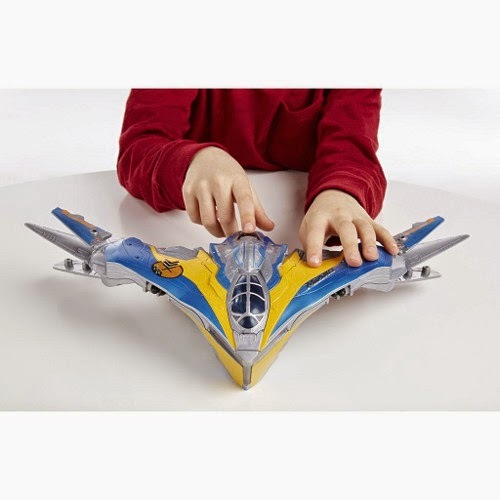 Hold down the button on the Milano Starship for the sound of rapid-fire blasting, and then let it go to hear the thundering boom of your enemy's fate! (80s music not included but highly recommended). There was a time when Star-Lord was a loner, an astronaut who played by his own rules. 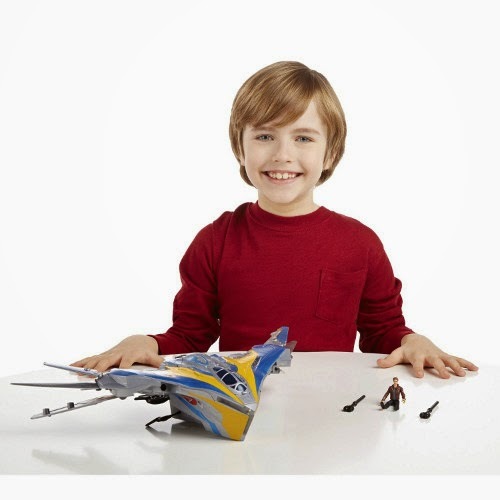 But now, he's using the Milano Starship on a mission to save the universe!... or at least see more of it before it's destroyed. 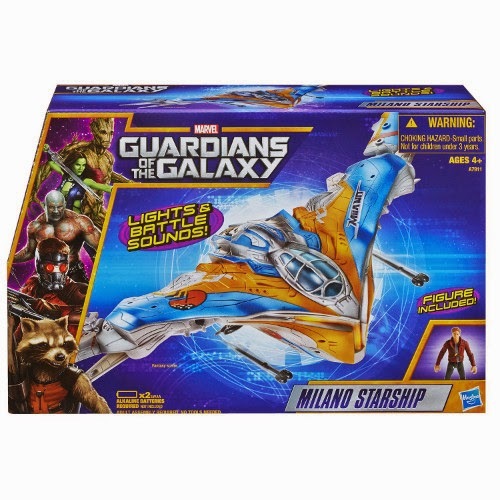 Includes Milano Starship, 2 missiles, Star-Lord figure, and instructions.